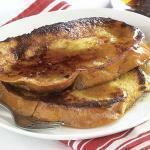 This classic french toast recipe is perfect for a Sunday morning breakfast or brunch. Make it with whole wheat, white, cinnamon, raisin or french bread. In a medium size bowl, combine egg, milk, cinnamon, vanilla extract and salt. Beat until combined. Heat lightly buttered skillet over medium flame. Soak a bread slice from each side in the egg mixture for about 10 seconds. This allows the egg mixture to absorb in the bread properly. Place egg mixture soaked bread on the skillet. Flip the side when it turns golden. Let the other side cook until golden. Remove from the skillet. Serve warm with maple syrup and topping of your choice. I like it with banana slices, blueberries or strawberries.